Islam & Science » So, Who Did Discover America? Abu Rayhan al-Biruni, an Islamic scholar born a thousand years ago in Central Asia, calculated Earth’s circumference with astounding accuracy and invented specific gravity, the measure of a substance’s density compared to that of water. He rejected creationism, accepted that time has neither a beginning nor an end, and—5 centuries before Copernicus—argued that the sun might be the center of the solar system. Now, an influential U.S. scholar has proposed adding another laurel to that list: inferring the existence of America. Whereas some scholars think Biruni deserves credit for his continental prediction, others argue that his inference of unknown landmasses between Europe and Asia does not constitute a discovery. For more than a century an army of scholars, enthusiasts and outright eccentrics has delved into the question of who discovered America. Some of the claims are truly exotic, with fanciful reportage on ancient Phoenicians in Rhode Island or Chinese from the Middle Kingdom in the Bay Area. Back in the 1950s the colourful Norwegian ethnographer and adventurer Thor Heyerdahl contended that Peruvians in sailboats made of balsa wood were commuting back and forth between the Americas and Polynesia centuries before Columbus set sail. Leaving aside patently absurd theories, there are a number of serious­ claimants for the title. First comes Zuan Chabotto (c.1450-99), the Venetian navigator and explorer. His claim turns on the fact that Columbus did not reach the American mainland until 1498, while he touched the North American shore a full year earlier. That he had set sail from England caused him to be remembered in the Anglophone world as John Cabot and shifted bragging rights from Venice to the ‘Sceptred Isle’. Then it turned out that, while Cabot found investors in Bristol and received a patent from Henry VII, his principal financial backer was an Italian banking house in London. The laurels shifted back to Italy. In 1966 an English scholar, Alwyn Ruddock, discovered a letter of 1498 written to Columbus by an English merchant named John Day. In it, Day asserted that it was ‘considered certain’ that the North American mainland, which Cabot had visited the previous year, had been ‘found and discovered in the past’ by seamen from the port of Bristol (which happened to be Ruddock’s home town). Ruddock unearthed more papers suggesting that these pioneering Englishmen had reached America as early as 1470. Unfortunately Ruddock ordered all of these papers to be destroyed at her death in 2005. Just as it seemed that the prize was about to head north again, fresh doubts set in. Amid this ping-pong match, Francesco Guidi-Bruscoli, the Italian historian who had discovered information on Cabot’s Italian backers, came across a yellowed parchment map with an intriguing notation suggesting that Cabot may have been dispatched to confirm a discovery made many years earlier. Written in Italian, it states that ‘Giovanni Chabotte’ (Cabot) from Venice had been commissioned to sail to the ‘new land’. That the reference to new land was preceded in Italian by the definite article, il, rather than the indefinite un suggested to Guidi-Bruscoli that Cabot’s sponsors already knew of the Americas, thanks to reports by an earlier explorer. Cabot was simply verifying what was already known. Meanwhile scholars from Scandinavia have examined the Norse sagas for evidence that their forebears had sailed to North American shores before the English and Italians. The story of Vikings plowing the waves in their narrow-hulled boats to explore and settle Greenland is by now well known and confirmed by archaeological finds along Greenland’s south-western coast. At the beginning of the 20th century Professor Gustav Storm of the University of Christiania in Oslo produced evidence that Norsemen had made several trips to within sight of the Canadian coast, identifying and naming Markland (southern Labrador), Helluland (Baffin Island) and Vinland, which is thought to be Nova Scotia. Among these adventurers Leif Ericson (970-1020), the son of Eric the Red (c.950-1003), who had discovered Greenland, entered the history books for his sighting of Vinland in about 1000. True, one saga from 1387 states that a certain Bjarni, Son of Herjulf, had beaten Leif to Vinland, having been blown off course and sighted land there as early as 985-6. But no further support for the Bjarni claim has turned up. Just what is meant, then, by this Norse ‘discovery’ of North America? Leif Ericson was a Christian missionary who had been sent to Greenland by King Olaf I of Norway (r.995-1000) with orders to bring the faith to settlements there. On the return voyage his boat was blown so far south that he was brought within view of Nova Scotia. The authors of the Norse sagas, amazed that he survived this adventure, dubbed him ‘Leif the Lucky’. Except for Ericson, most of the other Norsemen who made contact with North America were traders by profession. Had their commercial interests fared better, they might have given the continent a second look, but they didn’t. Their one serious venture onto North American territory resulted in a fight with native Americans, after which they quickly fled to their boats. The southernmost confirmed evidence of Vikings in the New World was discovered in 1960 at L’Anse aux Meadows, on the northern tip of Newfoundland. From the sod houses and primitive artefacts that archaeologists excavated at L’Anse aux Meadows and in Greenland these Norse traders emerge as hardy adventurers. As to their ‘explorations’, they were carried out in a thoroughly ad hoc way, usually the result of accident or unfavourable winds. At their most deliberate the Vikings strove each time to sail a little further down a coastline than their immediate predecessor. Either way, when they returned to Greenland, Iceland or Norway they told their tales to wide-eyed listeners huddled around log fires. There is no evidence that any of the Viking leaders who headed towards North America were literate. It took another three generations before Adam of Bremen (c.1050-1081/5) in northern Germany, wrote the Gesta Hammaburgensis Ecclesiae Pontificum, a chronicle which included the stories he had heard concerning the adventures of Leif the Lucky. Adam and other chroniclers and authors of the sagas offered their reports in a stolid and matter-of-fact way, with no indication that they had any idea of the implications of these remarkable travels. At around the same time that the Vikings were venturing south and westward from their bases in Greenland, a very different process of discovery was taking place in landlocked territories many months’ journey from the nearest open salt water. Beginning more than 3,000 years ago, traders from the great urban centres of what is now Uzbekistan, Turkmenistan and Afghanistan had sent goods across Eurasia, from Europe to India and China. They moved their cargo in long camel caravans, which carried the equivalent of a dozen or more modern freight containers. Gold and silver coins minted in their cities were honoured as currency as far afield as Sri Lanka and England. Vikings, among others, collected hordes of these beautifully crafted coins because they knew they would be accepted widely. Once back home the Central Asian traders not only told their tales around neatly built hearths in solid multi-storey houses but wrote down detailed information on the geography and climates of the lands they had visited. Local scholars collected and analysed these reports. The greatest of these scholars was Abu Raihan al-Biruni. Born in 973 near the Aral Sea in what is now Uzbekistan, while still a youth Biruni mastered mathematics, astronomy, mineralogy, geography, cartography, geometry and trigonometry. He spoke Persian, Arabic and Khwarazmian, the language of the Sunni dynasty that ruled Greater Iran between the 12th and 13th centuries. Later on he also studied Sanskrit. While still a young man Biruni had calculated the latitude and longitude of his home town and had begun to collect similar co-ordinates for other places. Using ancient Greek sources he compiled data on hundreds of locales in the Mediterranean world and then began adding calculations on other locations from all points of the compass. From ancient writers like Claudius Ptolemy (c.150 BC), from more recent sources and from his own field observations he knew that the earth is round. By the time he was 30 Biruni was employing the most advanced systems of the day to calculate its precise circumference. In a pioneering effort not matched until the Renaissance he constructed a globe 16ft high showing the Earth’s terrestrial features. Biruni followed in the footsteps of several other scientists from Central Asia. Among them was Ahmad al-Farghani, from what is now Uzbekistan, who in the ninth century had calculated the width of one degree of longitude at the equator, from which he deduced the earth’s circumference. His calculation, though less precise than Biruni’s, marked a significant improvement on those made by the ancient Greeks and assured a wide readership for his book on the subject, A Compendium of the Science of the Stars (c.833). Five centuries later Columbus came across a Latin translation of Farghani’s treatise. Besides welcoming confirmation that the Earth is round, Columbus used Farghani’s data to argue before sceptical potential sponsors that it was small enough for him potentially to circumnavigate. However, Columbus wrongly assumed that Farghani had presented his measurements in Roman miles rather than Arab miles. This caused him to understate the actual circumference of the earth by 25 per cent. His misreading caused (or, if it was deliberate, enabled) Columbus to place Cipango, or Japan, near the Virgin Islands. This convenient error proved crucial in Columbus obtaining funding for what he estimated would be a relatively short voyage to China. Biruni had also delved into mineralogy, specifically the relative density and weight of minerals of all types and how the separate minerals interact in nature. In the process of this research he discovered the concept of specific gravity. Just how Biruni acquired his passion for precise measurement is a mystery. It certainly owed something to his education, which included study of the classical Greek scientist Pythagoras, who had proclaimed that ‘things are numbers’. Biruni’s constant urge to quantify whatever he observed, combined with his enquiring mind, was to plunge him down a path that led to epochal insights, which in most respects put Columbus, Cabot and the Vikings in the shade. 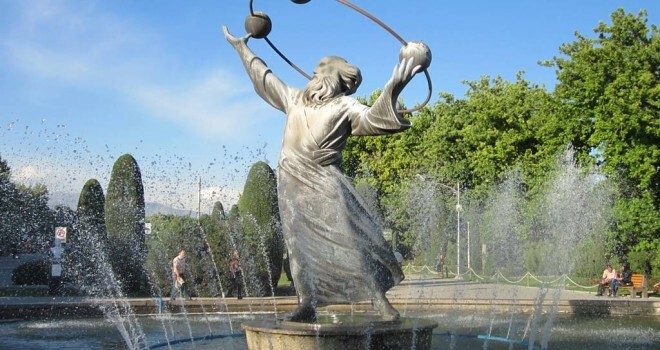 By 1017 Biruni had become an honoured scientist at Gurganch, the intellectual capital of his home region of Khwarazm. But in that year a fierce and religiously fanatical Muslim ruler from Ghazni in Afghanistan, crushed Khwarazm and destroyed its capital. Mahmud of Ghazni, as he was known, was a brutal man but, like many rulers in the region, tried to surround himself with poets and learned scholars. He ordered Biruni to come to Ghazni and bring the results of his research with him. Biruni, with no way out, not only complied but seized upon the move as an opportunity to learn more about India, which Mahmud had conquered over the previous decade. But Mahmud was as difficult as he was ruthless and Biruni quickly realised that he had to distance himself from his court. He removed to Lahore, now in Pakistan, where he penned the world’s first book on comparative religion, focusing on Hinduism and Islam. Gathering his notes and no equipment other than a simple astrolabe, he then withdrew to a heavily fortified hilltop castle at Nandana, not far from what is now Islamabad. There Biruni returned to the old problem of measuring the earth’s circumference. To this end he devised a new technique, which involved careful observation, spherical trigonometry and the application of the law of sines. Besides being far simpler than using two distant points on flat land, this method produced a measure of the earth’s circumference that was a mere 10.44 miles less than the definitive modern measurement. After Mahmud’s death in 1030, Biruni hauled his field notes and papers back to Ghazni in Afghanistan, where Mahmud’s son, Masud I (r.1031-40), welcomed him and helped him to settle into a quiet life of research and writing. Biruni wrote up his lifetime’s research on specific gravity and then turned to writing a vast tome, known as the Codex Masudicus, in which he summarised everything known at the time about astronomy and allied disciplines. It was in the Codex Masudicus that Biruni considered the possibility that the sun is stationary and that the earth revolves around it. He stopped short of fully embracing a heliocentric view, noting instead that the notion of a heliocentric universe is no less logical than its alternative and called on mathematicians and astronomers either to refute it or accept it. It is no wonder that historians of science judge the Codex Masudicus to be the greatest work on astronomy from the period between late antiquity and the modern era. In his codex Biruni also hypothesised about the existence of North and South America. Biruni began by presenting the research on the earth’s circumference that he had carried out at Nandana. He then set about fixing all known geographical locations onto his new, more accurate map of the globe. His list of longitudes and latitudes had grown substantially since his earliest collection and now included more than 70 sites in India alone, as well as hundreds of other locations stretching across the Eurasian land mass. When Biruni transposed these data onto his map of the earth he noticed at once that the entire breadth of Eurasia, from the westernmost tip of Africa to the easternmost shore of China, spanned only about two fifths of the globe. This left three fifths of the Earth’s surface unaccounted for. The most obvious way to explain this gap of 15,000 miles was to invoke the explanation that all geographers from antiquity down to Biruni’s day had accepted: that the Eurasian land mass was surrounded by a ‘World Ocean’. But was three fifths of the Earth’s circumference really nothing but water? Biruni considered this possibility but rejected it on the grounds of both observation and logic. From his study of specific gravity he knew that most solid minerals were heavier than water. Would so watery a world not give rise to serious imbalances to which the planet would have had to adjust over time? And why, he asked, would the forces that had given rise to land on two fifths of the earth’s belt not also have had an effect on the other three fifths as well? Biruni concluded that somewhere in the vast expanses of ocean between Europe and Asia there must be one or more unknown land masses or continents. Were these unknown continents empty wildernesses or ones inhabited by human beings? To address this question Biruni turned to his data on longitudes. He noted that human beings inhabit a broad north-south band stretching from Russia to southern India and the heart of Africa. If the unknown continent or continents were uninhabited, he reasoned, they would have to lie either north or south of this band. To pursue this hypothesis Biruni went beyond his field observations and employed Aristotelian logic, a reasoning process built from propositions. Noting that the Eurasian land mass stretched roughly around the Earth’s belt, he hypothesised that it must have been the result of powerful processes that would surely have obtained elsewhere. Known evidence of the Earth gave him no grounds for believing that the unknown continents would be squashed into the northernmost and southernmost latitudes. He concluded that the unknown land masses between the Atlantic and Pacific Oceans would have to be inhabitable as, in fact, they were. Biruni reached these momentous conclusions about the existence of the New World by 1037, basing them on research he had conducted over the preceding three decades. Did Biruni discover America in the first third of the 11th century? In one sense, definitely not. He never laid eyes on the New World or the continents about which he wrote. By contrast the Norsemen had actually touched land in North America shortly before ad 1000; briefly, to be sure, and without really understanding what they had found. Leif Ericson was so uninterested in the forested shore of North America that he did not bother to return later, nor did any of those who heard oral reports of Ericson’s travels or read about them in later Norse documents. Still, if ‘discovery’ includes the unreflective processes of Norse seafaring, then the prize must go to the Vikings. Yet Biruni is at least as deserving of the title of North America’s discoverer as any Norseman. Moreover, the intellectual process by which he reached his conclusions is no less stunning than the conclusions themselves. His tools were not the hit-or-miss methods of Venetian seamen or Norse sailors but an adroit combination of carefully controlled observation, meticulously assembled quantitative data and rigorous logic. Only after a further half-millennium did anyone else apply such rigorous analysis to global exploration. Having assembled all known knowledge of the subject, studying the wisdom of ancient Greeks and Indians as well as medieval Arabs and fellow Central Asians, Biruni devised completely new methods and technologies to generate his voluminous and precise data and processed it with the latest tools of mathematics, trigonometry and spherical geometry as well as the austere methods of Aristotelian logic. He was careful to present his conclusions in the form of hypotheses, on the understanding that other researchers would want to test and refine his findings. This did not happen for another five centuries. In the end European explorers confirmed his hypotheses and vindicated his bold proposals. This son of Central Asia was arguably the greatest explorer between the ancient world and the great age of European exploration. Two features of Biruni’s work warrant this conclusion. First, he achieved what he did through the systematic and rigorous application of reason and logic, unconstrained by religious or secular dogmas, folklore or anecdotes. He was a Muslim, but broke free of the culture-bound assumptions of Islam in a way that scientists in the Christian West struggled for several more centuries to achieve. He carried out his breathtaking intellectual explorations while living far from the sea in a landlocked region and without leaving his study except to carry out scientific measurements. While he was absolutely confident in his conclusions, his written presentation of them indicated the precise paths by which someone seeking to disprove him might proceed. Who today can better the credo that this Central Asian polymath penned a thousand years ago? … in an absolute sense, science is good in itself, apart from its [content of] knowledge; its lure is everlasting and unbroken … [The servant of science] should praise the assiduous [ones] whenever their efforts [arises from] delight [in science itself] rather than from [the hope of achieving] victory in argument. Even today, Biruni’s modus operandi strikes one as astonishingly modern, a voice of calm and dispassionate scientific enquiry sounding forth from the depths of the irrational and superstitious medieval world. Biruni accomplished all this while living and working in a region which many still regard as backward, a region immersed in superstition, fanaticism and violence. His birthplace in western Uzbekistan is close to the Aral Sea, where from the 1950s the Soviet Union created one of the most fearful ecological disasters of modern times. His achievements took place in a bleak zone on the northern border of Turkmenistan, far from the enormous gas fields that are today transforming that country into a Central Asian Kuwait. His research at Nandana, in what is now the West Punjab territory of Pakistan, put him within an hour of Jammu and Kashmir, the future scenes of a half century of armed struggle between Pakistan and India. As to Ghazni in Afghanistan, where he penned his renowned Codex Masudicus, simply to reach this town today is a dangerous task, requiring armoured vehicles and armed guards to traverse the heavily mined road from Kabul or Kandahar. But one can do so nonetheless and can, amid the desolate remains of ancient Ghazni, ferret out the actual tomb of Biruni. Here in the very heart of Afghanistan lie the remains of the most modern explorer of the Middle Ages, a man who was open to the entire world and to all the knowledge it contains. If and when Afghanistan gains a stable government and begins to develop, travellers and tourists will visit Ghazni, the scene of Biruni’s great work as a global explorer, and pay their respects at the tomb of one whose achievements match those of Columbus. S. Frederick Starr is research professor at the Paul H. Nitze School of Advanced International Studies at Johns Hopkins University and a founding chairman of the Central Asia-Caucasus Institute.